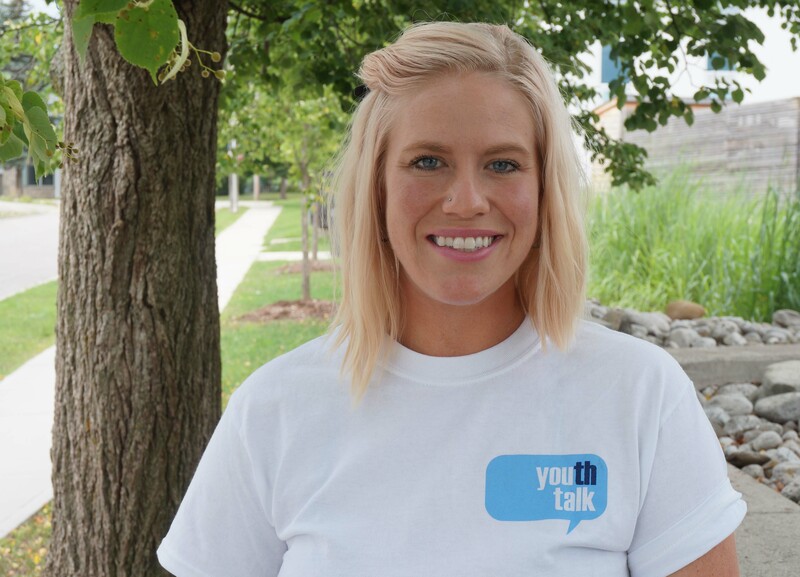 Giving youth a voice in Mental Health Promotion, Jessica Schumacher is a Youth Engagement Facilitator at CMHA WW. She loves to see youth come together for an important cause, and thrives in her work environment that is full of shared passion, creativity, and learning. She helps youth to develop leadership skills, build resiliency, and discover more about themselves as they become empowered. It brings her such joy to see awareness being spread throughout the community, knowing they are really working on smashing the stigma behind mental health. Read more about Jessica below. 1. What is involved in your role as a Youth Engagement Facilitator? As a Youth Engagement Facilitator at CMHAWW, my role involves many different initiatives and hands-on work with youth in the Wellington-Dufferin area. The largest part of my job is coordinating the YouthTALK Program. YouthTALK is a program for youth by youth that aims to promote awareness around mental health and suicide and decrease stigma. YouthTALK school teams work on projects (such as delivering mental wellness kits at exam time to reduce stress), run activities (including t-shirt campaigns and positive message murals) and provide educational information within some high schools in the Guelph-Wellington-Dufferin area. YouthTALK also has a regional team made up of a core group of members who plan, organize, and facilitate an annual mental health and wellness conference with themed workshops, speakers, and activities around these topics. The YouthTALK Conference is generously funded by #GetInTouchforHutch. The youth on the Regional team not only put on this conference, but they also help me to deliver presentations on mental health and wellness by sharing their personal experience with mental health and the YT program. They also volunteer at community events to educate, foster inclusion, and promote positive mental health to all. My role specifically for the YT program is to provide training and support to create these school and community based youth-led project teams that will inform peers about mental health promotion, encourage resilience and provide information about resources. With the Regional team, I run the group meetings and assist the youth with conference planning, organizing, and behind the scenes work, as well as guide them with developing their facilitation skills for presentations, and providing community volunteer opportunities. YouthTALK is 100% funded by the United Way Guelph-Wellington-Dufferin. Sit on 5 different committees regarding youth within Guelph-Wellington-Dufferin, and through them I have been able to connect with other youth service providers in the region and partner up with different organizations for numerous youth initiatives, including presentations, activities, and community events all including components of positive mental health and wellness. Facilitate presentations through CMHA in schools and in the community related to mental health and wellness, including topics such as stress, anxiety, positive coping, bullying, resilience, healthy relationships, goal setting, and more. These presentations generally incorporate hands on activities for the youth. I host booths at a variety of community events to raise awareness, provide resources, and engage with the public. Lastly, as a certified safeTALK trainer, I deliver safeTALK presentations to community members. 2. What brought you to CMHA WW? Why do you enjoy working at CMHA WW? I had worked with youth in both recreational and educational settings, but it wasn’t until I started a University placement volunteering at a drop-in center with youth who were experiencing homelessness and/or struggling with their mental health and addictions that I realized my desire to want to help others, and foster community development. As a result, I furthered my education centering on community engagement, facilitation, and leadership while working with different residential treatment homes, shelters, and drop-in centers until I began working at CMHA. I enjoy working at CMHA WW because I know the work that I do is really making a difference in the community and especially with youth. I have always been a strong advocate for healthy living and wellness. This job allows me to do what I love most, being out in the community engaging with young people, and watching them become empowered and build their own resilience and leadership skills. No two days are the same, and there is always something new and exciting to take part in. CMHA has allowed me to obtain personal growth and further my education through numerous workshops and training opportunities. As a result, I have become a safeTALK trainer, with the hopes of being certified with other trainings in the future. 3. Have you always worked in mental health? I have always worked with youth on some level incorporating educational components, but did not work at a mental health organization until a placement in University at a drop-in center for youth who were experiencing homelessness and/or struggling with their mental health and addictions. From then on, I have always been involved with children and youth in mental health in some way, including mental health and addictions, developmental needs, low-income families, new immigrants, residential treatment homes, and more. 4. How do you support people in the YouthTalk program? I support youth by helping them to work towards their own goals and making changes they want to see, whether that is in their own lives, with peers, or in the community on a larger scale. It really comes down to supporting the youth by giving them a voice to be able to make decisions and have a say in what is really important to them, and helping provide opportunities for empowerment and personal development. This includes supporting them to build their own resiliency to be able to cope with the stressors and struggles they face, and work on improving their own mental health and wellness. For the program overall, I support the youth and the team advisors by providing resources and education, guidance and direction for the meetings, and assistance with events and activities. We also do check-ins at the group meetings and from there, if a further conversation is needed, I will talk to the youth and help direct them towards other services and people to get in touch with. 5. What are you particularly proud of during your time at CMHA WW? The first time I ran the annual mental health and wellness conference with the YouthTALK Regional team. I worked all year with youth, some of whom were facing significant challenges of their own, getting together every couple weeks for planning meetings. I was able to watch them grow and develop leadership and teamwork skills, seek confidence to talk about mental health to their peers, and build their own resiliency to deal with their own stressors and challenges. The YouthTALK members’ passion never faltered and they were open and willing to contribute efforts wherever and whenever was needed. The day was amazing, and the fact that they do all of this to educate their peers is something I am extremely proud of. I am also really proud to be able to say this is what I do for a living. My work with mental health and wellness is so valuable and important, and I am just glad that I am able to be a part of meaningful change that happens.